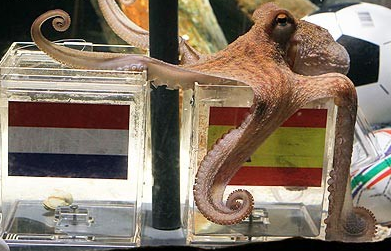 Paul the Octopus, who according to all sources available has correctly chosen every winner of this year’s FIFA competition, has chosen Spain to beat the Netherlands. I am anxious for this to be proven false, though my gut feeling is that the owner has done statistical research on each team and places the better smelling food in whatever HE chooses to be the next winner. In anycase, the game starts in two minutes so I will be watching.